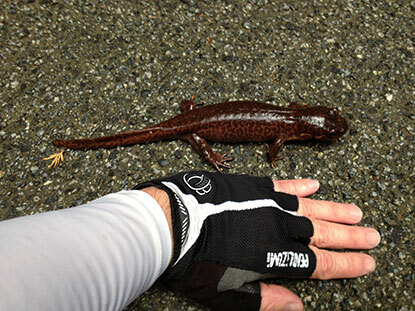 On a Saturday morning climb through the redwoods of Tunitas Creek Road in coastal San Mateo County, I caught up to this big guy, a Coastal giant salamander (Dicamptodon tenebrosus). He was pointed toward the creek, so I boosted him across the road and carried on. A small ribbon snake graced the top of my climb on Irish Ridge in coastal San Mateo County a few weeks ago while I was on a Sunday bike ride. Riding up Tunitas Creek Road in coastal San Mateo County, I found a curious-looking stick on the road under the redwoods. It was very straight, but ever so slightly undulating. 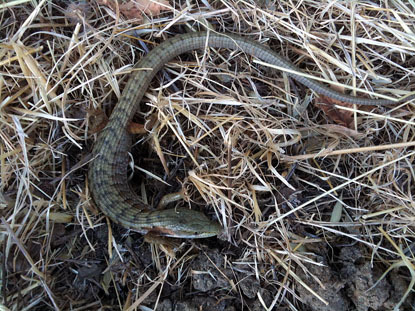 I picked it up, and it became a dead snake, and when I started to put it back down, it became a very alive Sharp-tailed snake (Contia longicaudae). Charmed by the warmth of the road, it was probably waiting for some food to amble by. 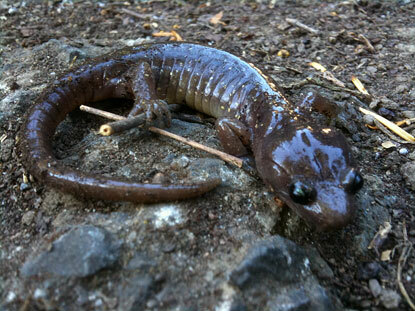 I found this Aboreal salamander (Aneides lugubris) while working in a garden adjacent to People's Park in Berkeley, CA. It lived among the discarded hypodermic needles of the drug addicts that habituate the park. I moved it away from the fence to the other side of the garden, picking it up with cupped hands, which was the right way to do so. I didn't know it at the time, but it turns out that these things have a mouth full of nasty-looking teeth and they are sometimes liable to bite if you grab them. I usually spend at least 4 hours of my weekend road cycling in unbelievably gorgeous coastside San Mateo County, where I'm always on the lookout for snakes. This past Saturday paid off with two good catches. At a little past the midway point of the 61-mile ride, my chain came off. After I put it back on, I reached to this piece of cardboard to wipe the grease off my fingers. 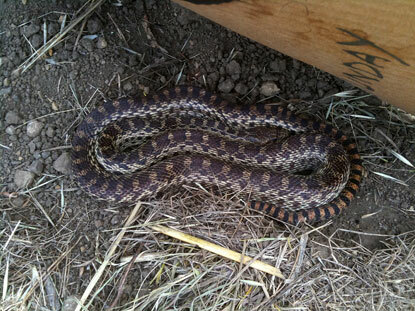 Lo and behold, a nice 4ish foot Pacific gopher snake (Pituophis catenifer), was using it for its bedroom ceiling. 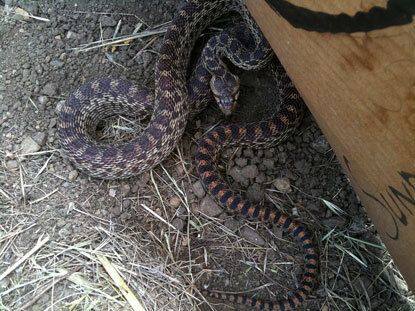 As usual, we got a rattlesnake impersonation act. 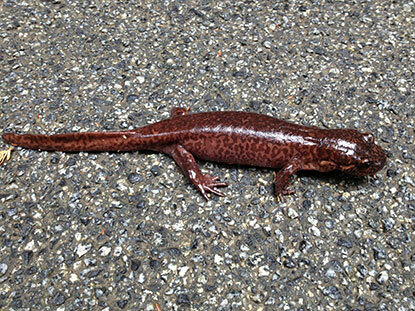 They can be pretty convincing to the less-herp inclined. 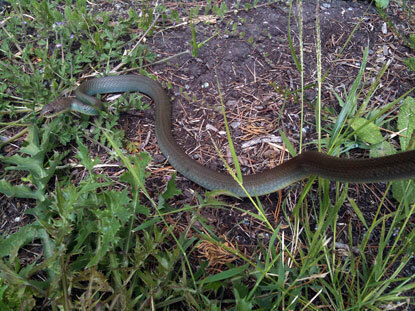 A few miles further along in the ride, we came upon this California yellow-bellied racer (Coluber mormon). This was the first time I've caught one of these. 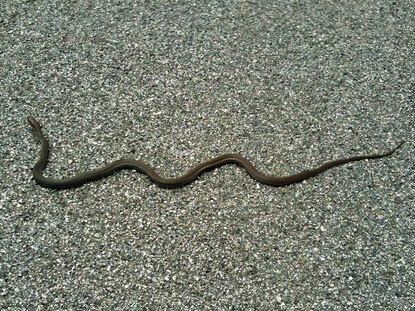 Here it's sunning itself on the road. And here it's posing as I hold its tail. 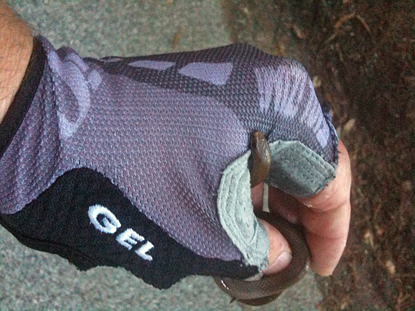 Thanks to my riding buddy for being patient with the snake freak. 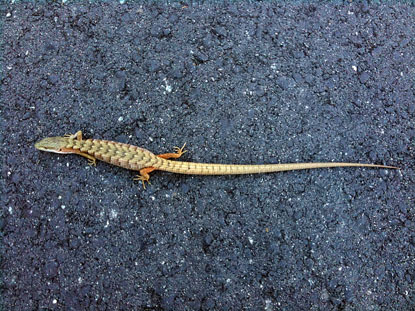 I saw this 10-inch long Southern alligator lizard (Elgaria multicarinata) while riding up a rural/suburban lane in Woodside tonight. 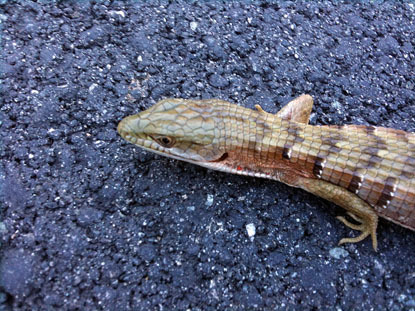 It was hard to get him off the road as he kept trying to hide under my shoe. I finally picked him up and put him in the grass.